Peter Soriano, Permanent Maintenance, 2016, wall drawing installation in the lobby of the Colby College Museum of Art. While working on the Colby project, Soriano spent hours in the Museum’s lobby and the adjacent outdoor sculpture courtyard. He became intimately familiar with the lively, transitory space that most people at Colby simply pass through en route to somewhere else. Soriano’s drawing (the term is used expansively here—much of his “drawing” is done with Rust-Oleum spray paint) is an ephemeral, living response to this space and to the college that surrounds it. Soriano closely observed the campus over the course of ten months, focusing on landmarks and banal infrastructural forms alike. 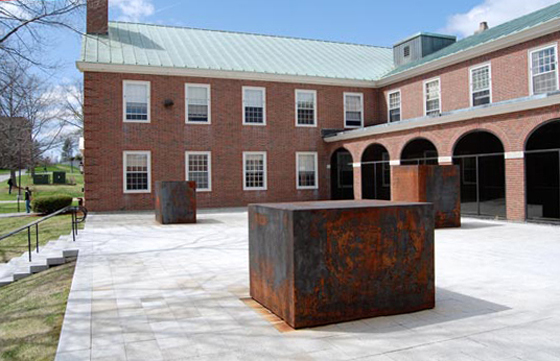 Richard Serra’s sculpture 4–5–6 (2000), three weathered steel boxes that have become an emblem of the Museum’s identity, came to play a critical role in Soriano’s drawing, embedding a specific history and content within Permanent Maintenance, from the history of art and Serra’s post-minimalism to the site of the Colby campus and the Colby Museum’s collection. Serra’s sculpture, along with HVAC systems, bucolic lawns, traffic stanchions, stairs and railings, signs and hydrants, is among the features that make up the working landscape of the college, managed and maintained to produce optimal conditions for higher education and cultural enrichment. All are sources from which Soriano drew in composing the three walls of Permanent Maintenance. This title evokes the continual attention necessary to keep a campus up and running. Maintenance is performed on buildings, vehicles, lawns, and other systems, including bodies. Relationships need maintenance, as do skills and scholarship. Maintenance makes productive outcomes possible. Maintenance supports the ongoing social and intellectual activities of a campus: the learning, seeing, writing, research, and dialogue that together produce Colby’s identity. The installational quality of Permanent Maintenance—environmental in scale, attuned to the spatial and social dynamics of place—creates a situation even for viewers who might not seek explicitly to engage with the marked and sprayed walls that surround them. Picture a young woman in the lobby, staring at her computer screen and shutting out the surrounding environment. She is nonetheless, “plugged in.” She is quite literally part of the apparatus or system Soriano has imagined, her computer’s power cord a linear extension of the drawing into the third dimension (making it sculptural, even if the artist now eschews sculpture). A sign designating the Custodial Closet, where the tools and fluids of perpetual maintenance are stored, becomes a key compositional element, as do the door handle and the door itself. Where does the drawing stop? It is integrated into the architecture, like an organism. Throughout Permanent Maintenance’s walls, lines imply their extension in space, into the lobby and beyond. The shapes that delineate 4–5–6 hover at the level of the floor, but elsewhere, points of lines will converge in the opening just past a doorframe. Red diagonal lines shoot past the junctures of floor and wall, wall and ceiling, suggesting infinite extension. Monolithic, imposing in scale and materials, 4–5–6 becomes something both to reiterate and to react against. The rectilinear form visible in the courtyard is rendered in triplicate. The red spray-painted outline is the result of Soriano “imagining the dimensions of the Serra work face on.” The orange outline is Colby painting student Taylor Schlichting’s estimate of the same dimensions. A clean brown outline represents the measured dimensions of the face of Serra’s sculptural blocks: 6′ x 4′. Through this exercise, Soriano establishes 4–5–6 as a unit of measure within Permanent Maintenance: it keys the drawing to the scale of its immediate surroundings. The artist and student produce crude, uncertain outlines of the sculpture’s forms. Measurements may be fixed, but scale is always relative. The permanent and occluding mass of Serra’s sculpture is translated into tentative outlines that record the temporal act of perception. Serra’s 4–5–6 is the only physical feature of the campus that most viewers will recognize when they look at Permanent Maintenance. In conversation, Soriano has revealed that numerous phenomena observed on campus, even a snow pile (there was record snowfall in the region in 2015), were among the sources for the work. But for most viewers, such specific referents will remain elusive, even as they orient the drawing temporally and spatially. 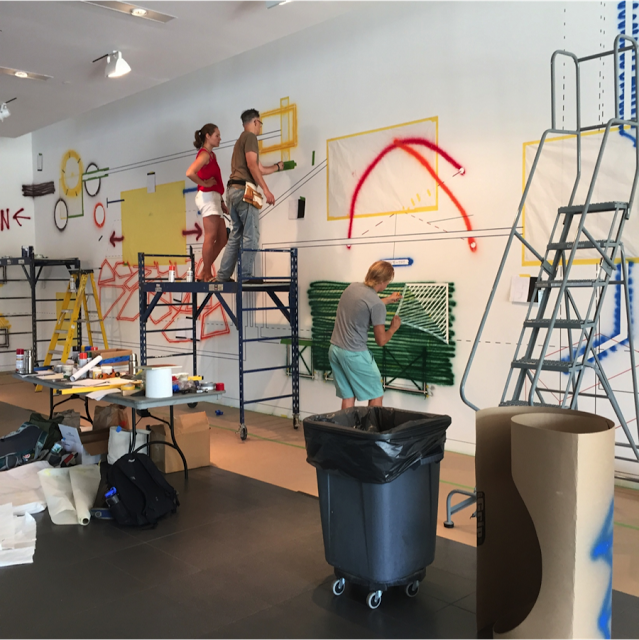 Using sketches and instructions from the notebooks, a team of artists at Colby created Permanent Maintenance. 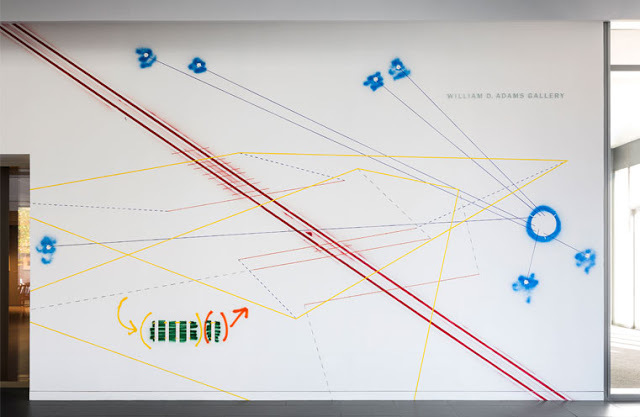 Soriano arrived at the forms of Permanent Maintenance by mapping, mirroring, and demarcating aspects of the Colby campus, and through seemingly irrational, intuitive mark-making only loosely tied to systems of representation. Throughout the drawing, his graphic signs seem based on visual languages designed to avoid ambiguity: architectural plans, surveyor’s marks, and mechanical diagrams. However, viewers who engage with Permanent Maintenance will find frustration a condition of the work. Inscrutable layered marks and notations (arrows, dash lines, X-marks) seem purposeful, direct. Yet to pursue these signs is to encounter a morass of lost information, directives impossible to follow, irrecoverable intentionality. Even as Soriano invokes causal systems, productivity, and the optimism of construction, he undermines the implied functionalism of the diagrammatic visual languages from which he borrows. The systems he evokes relate most immediately to the mechanical operations of the Colby campus. More broadly, these systems point to institutional structures, educational systems, and perhaps even the perpetual expansion and upgrading of the American college campus. For Soriano, the translation of haptic experience—the movement of the body through time and space—into graphic expression was the result of an intuitive evolution that began while he was still creating sculptures (see Elizabeth Finch’s essay). Such translation is rooted in an understanding of the minimalist and post-minimalist sculpture that emerged in the 1960s, which transformed spaces through “interventions,” often subtle: forms might be placed in unlikely locations, such as on the floor (laid flat), in a corner, or at the base of a wall, or they might block vision and movement through space. Serra’s 4–5–6 is an instance of the latter. 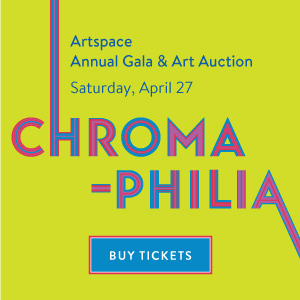 These works were conceived with acute awareness of the body’s movement and perceptual vagaries as the condition for the viewer’s experience of art. As the sculptor Carl Andre once put it, “My idea of a piece of sculpture is a road.” From a moving car, a road is not seen from a stationary, single-point perspective, but is revealed through continual motion. 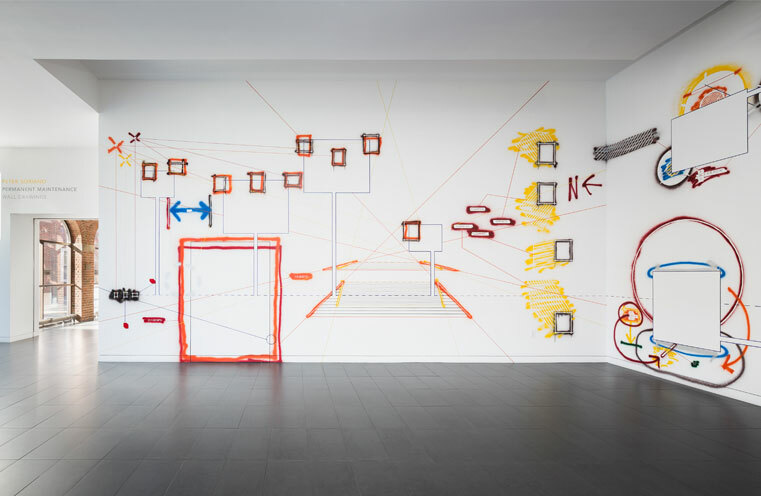 Soriano’s wall drawings capture this sense of a highly individualized, experiential perception of space through movement, thought, and imagination. 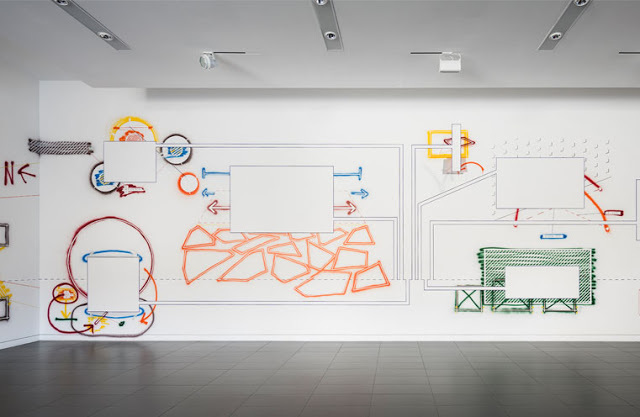 As wall drawings, they alter the space around them, becoming part of that space, transforming the walls into an active presence in the environment. Within these newly active walls, the lobby’s open space becomes part of the field of Soriano’s installation. Like Andre’s sense of sculpture as road, Soriano piece records a reality in motion, oscillating between the assertion of order inherent in rational systems and the less tidy realm of subjective experience. Strictly speaking, Permanent Maintenance cannot be moved or preserved; rather, to be reinstalled, it must be made anew. 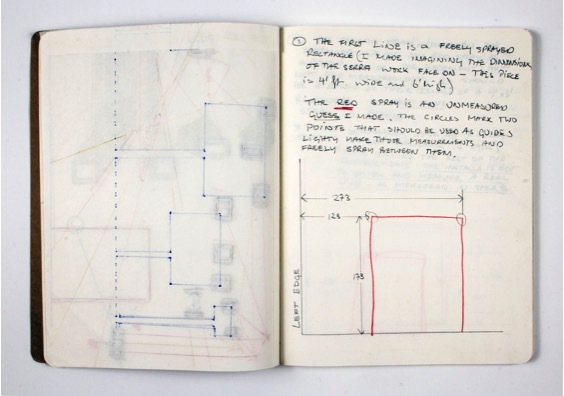 The Museum’s acquisition of the drawing is accompanied by Soriano’s detailed books of instructions for the remaking of Permanent Maintenance in the future, by individuals other than himself. The work can be remade either wholly or in part, scaled to new walls. Some features will closely replicate those of the original installation, while others are to be freshly generated in accordance with Soriano’s instructions. Error is courted, and subjectivity allowed to roam where it will: “Human error runs through this project quite frequently. Numbers are read or copied wrong constantly. The installer has to make subjective calls frequently,” Soriano writes in his guide to the work. Hence the later installations of Permanent Maintenance would not be mere copies of its Colby realization but would reflect the decisions of new drafters, giving the work a mutating, historical status. Eliminating the object was the result of a desire to create an unmediated experience. By collapsing the space between the artwork and the viewer, a wall painting negates the gap between lived time and pictorial time, permitting the work to engage larger philosophical, social, and political issues. 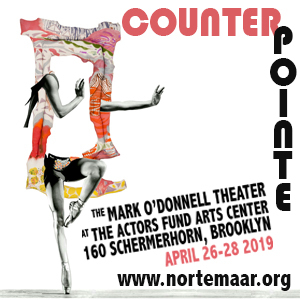 Bochner and his contemporaries sought a way past, or through, “the obstinate chunkiness of the third dimension.” Wall drawing contained the possibility of genuine immediacy: to become part of the space where life unfolds, negating the distance between life and art. Soriano’s engagement with life at Colby through drawing on the wall likewise exists within lived time rather than pictorial remove. These walls are living walls, a site not only for permanent maintenance but renewal. “Peter Soriano: Permanent Maintenance,” Colby College Museum of Art, Waterville, ME. On view through August 21, 2016. 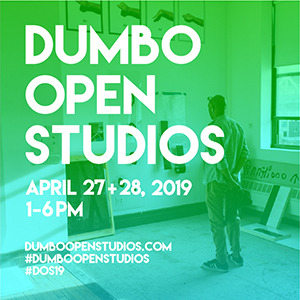 Author bio: Kirsten Swenson is an assistant professor of Art History, Contemporary Art & Aesthetics at the University of Massachusetts, Lowell. She is the author of Irrational Judgments: Eva Hesse, Sol LeWitt, and 1960s New York, published in 2015 by Yale University Press.